Heat treatments are 97 percent effective and have been proven to be the “gold standard” in bed bug treatment methods. They are the best not only because it is effective, but also because it is eco-friendly and pesticide-free. Heat works better than other methods due to the penetrating qualities that it provides. An exact location of all bugs in an infested home is not necessary — even if some bugs go undetected during an inspection, the heat will reach those areas. How Does the Heat Process Work? Heat is pumped into a building and sections are used to bring everything in the room – the walls, floors, etc. – up to the necessary kill temperature of 122 degrees, which is then held for a minimum of two hours. In order to achieve that temperature everywhere, the ambient room temperatures can reach up to 145-150 degrees. A good comparison is a very hot sauna. What Does a Bed Bug Heat Treatment Cost? Therefore, we do not offer a “one size fits all” pricing structure for heat treatments. Eliminating bed bugs is a costly endeavor, regardless of the treatment option you choose. Therefore, we recommend that you take the time to explore all your options with a technician specifically trained in bed bug management and elimination. We will walk you through the available treatments and recommend a method that will work best within your budget. How Effective Are Heat Treatments at Eliminating Bed Bugs? We are so confident in our treatments and so dedicated to your satisfaction that Northwest K9 Bed Bug Detectives offers a 35-day warranty on our thermal heat treatments. If the first treatment does not work, we will return to re-treat your home for free! Watch the video below to see how strongly a heat treatment affects bed bugs. Why Does Heat Treatment Work Better Than Other Methods? Whole-building fumigation is the only method more effective than heat treatment, and it’s too expensive for most clients. Fumigation is typically reserved for the worst of the worst cases. How Long Does This Bed Bug Treatment Take? Heat treatments typically take one day. Our crew starts in the morning and should be done by early evening, often before dinner is served! There are scenarios that may require additional time. Factors that can affect the length of the job include the size of building or home, how the building or home is constructed, how much insulation was used during the construction, whether or not the home has a full finished basement with a concrete floor. Every structure is different, but it is rare that we have to do what we consider a two-day job. 99 percent of our jobs are done in one day, but we’ll want to assess your situation before making an absolute guarantee. How Long Do Pesticide Treatments Take in Comparison? Pesticide treatments can be effective if the infestation is in the very early stages — before the bugs have spread into multiple nests in a room and multiple rooms, and if the extensive preparation is done exactly as outlined by the pest control company. In many cases, three to four pesticide treatments may be necessary to completely eliminate and infestation, meaning your home or business remains infested for the two-week period between treatments takee. After infestations have spread, the number of areas they can hide increases, therefore making the use of pesticides less effective. Bed bugs will hide in anything or anywhere in a home where they can find a crevice, fold, or dark area. There is no way to know for certain where all of the bugs and eggs are located, and pesticide treatments have to be direct. The substance must hit the bed bug directly, as over time bed bugs have built up resistance to pesticides. 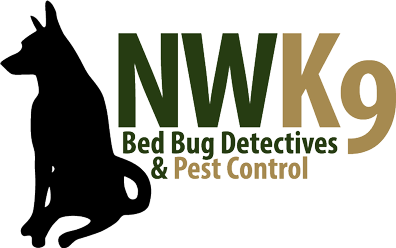 Here at Northwest K9 Bed Bug Detectives, we are regularly contacted by owners of bed bug-infested homes and businesses because the pesticide treatment plan they tried did not fully eliminate the bugs. This is referred to as “knocking down” an infestation or “controlling” an infestation. Pesticides can be effective in controlling bed bugs, but you have to ask yourself: would you rather control a bed bug population or eliminate it? Will I Have To Throw Away My Bed and Other Furniture? Bed bug heat treatments allow clients to keep their belongings as long as they have not been severely infested, saving you the expense of replacing furniture. Get a free estimate on a bed bug heat treatment for your home or business. Call Northwest K9 Bed Bug Detectives today!